Absolutely beautiful. Badiou speaks (writes) in a kind voice that leads the lay reader comfortably through his thoughts. 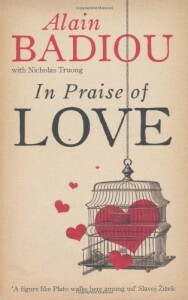 Although always coming back to love, badiou manages to touch upon other various subjects in an insightful manner. This booklet left me thinking much more than I thought a 70 page-ish record of a dialogue could.